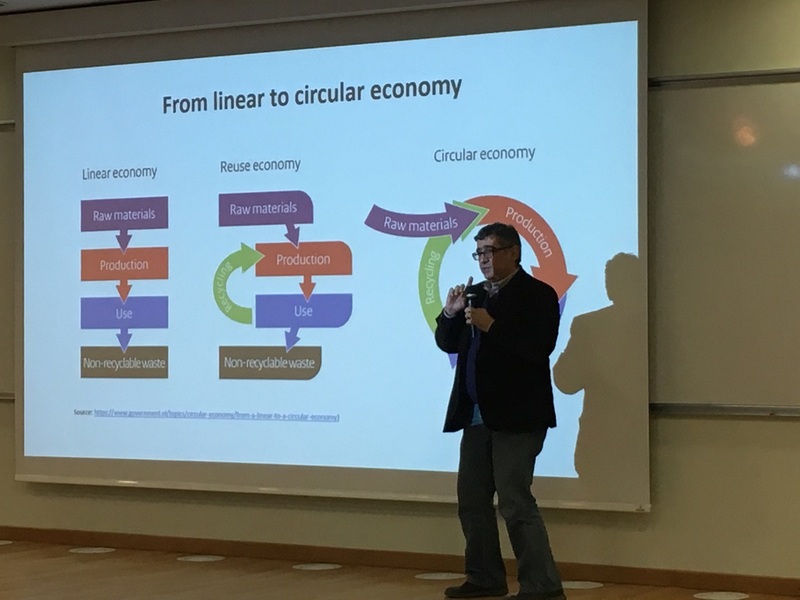 YEREVAN, Armenia ‒ Director of the Acopian Center for the Environment of the American University of Armenia (AUA), Alen Amirkhanian, made a presentation on the importance of transitioning to a circular economy at the World Usability Day, a conference held at AUA on November 10, 2018. 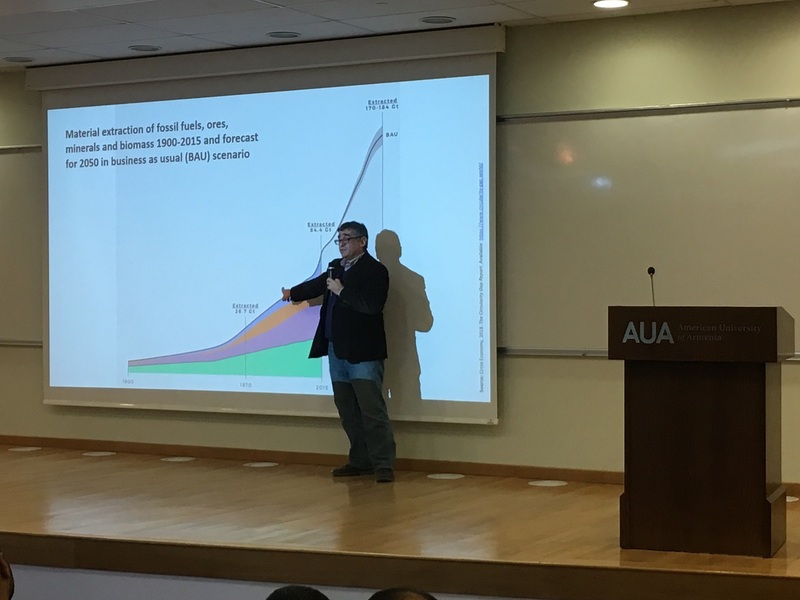 Also presenting at the conference was Arman Arakelyan, Adjunct Lecturer at the AUA Akian College of Science and Engineering (CSE) and lead organizer of the conference. 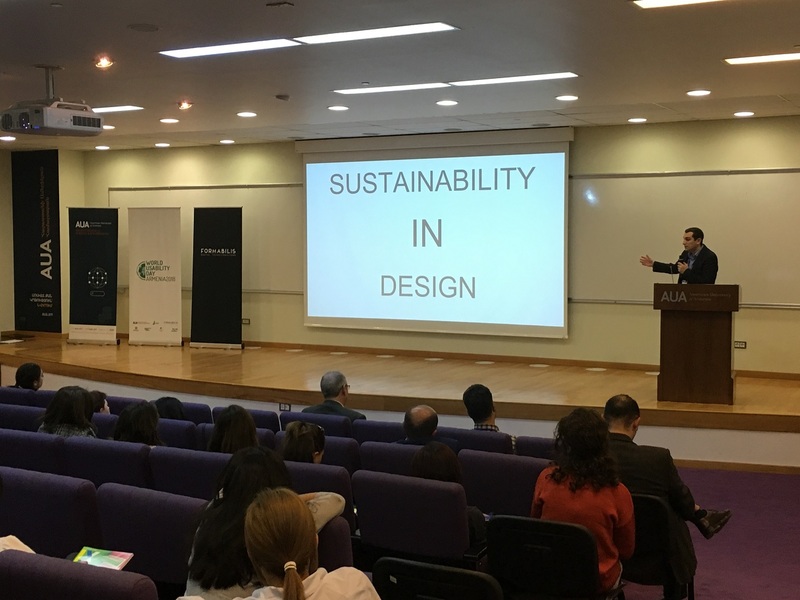 He spoke about sustainable interaction design, giving examples of “sustainability in design,” which prolongs the use, reuse and smart disposal of products. He also discussed “sustainability through design” promoting planning and lifestyles pertinent to sustainability. Amirkhanian’s presentation focused on four key aspects: the increasing resource stress on the planet; what circular economy is; ways of transitioning to a circular economy; and the critical role e-waste management in making such a transition. In a circular economy, the goal is to design, produce, use, recycle, and then reuse materials and energy for as long as possible in order to reduce waste and resource use. This stands in contrast to our current model, a linear economy, where the majority of materials are created, used, and then discarded in a relatively short life cycle and without consideration for the impact of discarded materials. In order to transition to a circular economy, we need technological, business, and political solutions. “Regions, countries, and cities are increasingly adopting circular economy approaches. Armenia would benefit from examining such an approach as it crafts its economic, consumption, and waste management policies,” said Amirkhanian. The conference was co-organized by Formabilis LLC and the AUA CSE. The keynote speaker was Gilbert Cockton from Northumbria University in Newcastle, England. Other speakers included Vahan Balasanyan from the Academy of Fine Arts, Karen Vardazaryan from Joomag, Nareg Kirkian from VMware, and Arevik Harutyunyan from Macadamian.